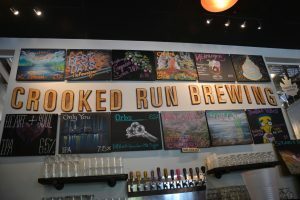 After we landed in Virginia, Thursday, for the Beer Bloggers Conference, Sean and I had the opportunity to go on a pre-conference lunch to Crooked Run Brewing in Sterling. We were 2 of only 5 bloggers attending the luncheon and were lucky enough to have 2 hours with Leland Rogan the co-owner of Crooked Run. 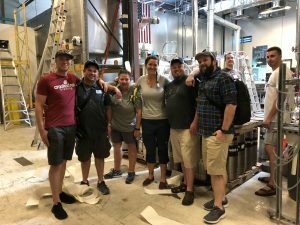 The intimate experience, allowed us to learn a LOT about the brewery and the area. 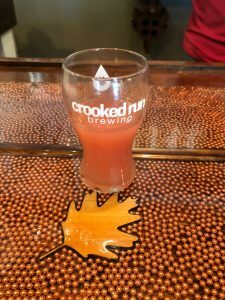 Crooked Run opened in a 600 sq ft space in Leesburg, VA in 2013 and then expanded to the space in Sterling in 2017. Both locations are located on the LoCo Virginia Ale Trail. The tap list offered a great blend of really good beers including Orbz DIPA brewed with green tea and milk sugar, Noriega a IIIPA (triple IPA) with pineapple, Glory their 5th anniversary Imperial Stout and Seek Truth Belgian Triple which were all great beers but my favorite was Raspberry Empress Sour IPA. Our lunch was tacos from Senor Ramon’s Taqueria located inside the taproom. There was a great selection of tacos that tasted amazing. After lunch we went out back and got a peek at the brewery and discovered all the fermenters are named after the Fresh Prince Of Bel Air characters. 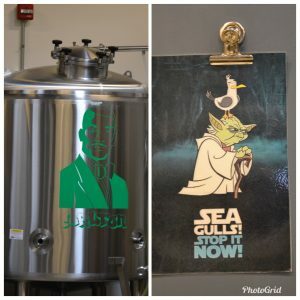 My favorite part of the tour was discovering a picture of Yoda being attacked by a seagull.